The Tellcard EGT is one sensational product. I have fitted 2 of these commercial digital locks of late and they not only look very professional, they are simple to fit, straightforward to program and easy to operate. I found these products on recommendation through The Society Of Professional Locksmiths, an organization of like minded professional locksmiths, where I am a founding member. Tellcard offered a promotion a while back to get their products further into the market. Initially I was shy, but thought "why not". And I'm very pleased with the end results. But more importantly, so are my customers. Inside view is as important as outside view, in my opinion because this is the point of view everyday users will see all the time. The Tellcard EGT houses a battery pack that is easily accessible meaning replacing batteries is a simple task. Life expectancy of the battery pack with typical use (20,000 operations) in a year is about 12 months. The extra nice feature of this product is that it is not only operable by battery. It also includes connections within for hard wiring, which means you can also hook it up to your internal alarm system and enjoy mains power without requiring to replace batteries. If power fails, the batteries will be your back up power to maintain access control. 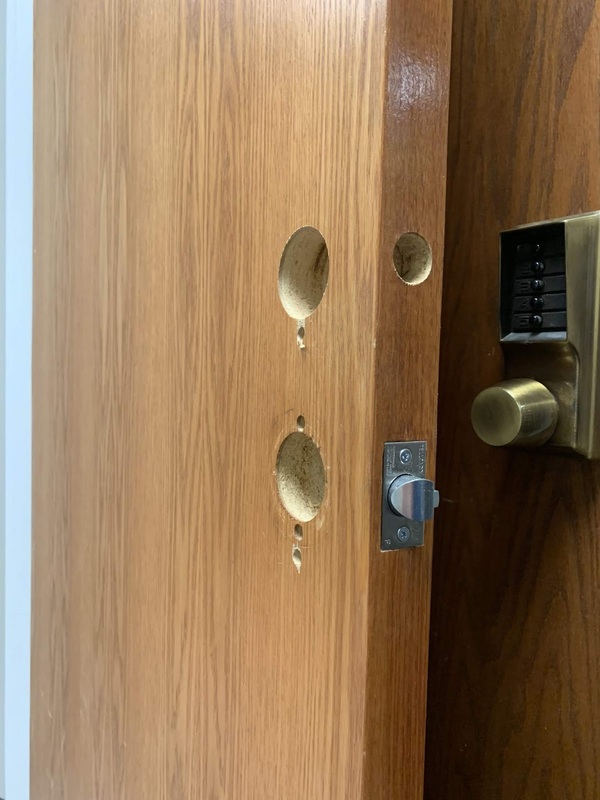 The particular fitting of this unit was to an existing door where someone had previously installed a handle and separate deadbolt. 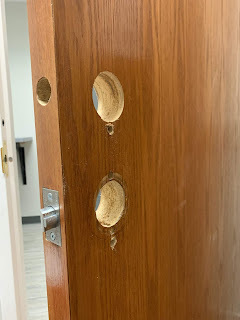 (You can see where the lazy installer used a knock in bolt instead of a correct wooden door installation bolt) This is the outside view of the application. 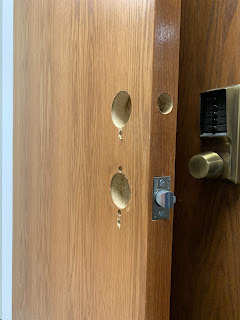 We were required to drill 2 additional holes, 1 just below the crossbore hole (deadbolt) and one a little farther below where the original commercial lever or knob would have been. The inside view shows a clearer image of the original holes where the commercial lock once sat. 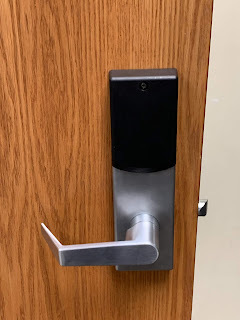 The end product and fitting, in the first image above displays a beautiful product that fits with the buildings decor and maintains a uniformity with other products in the building. 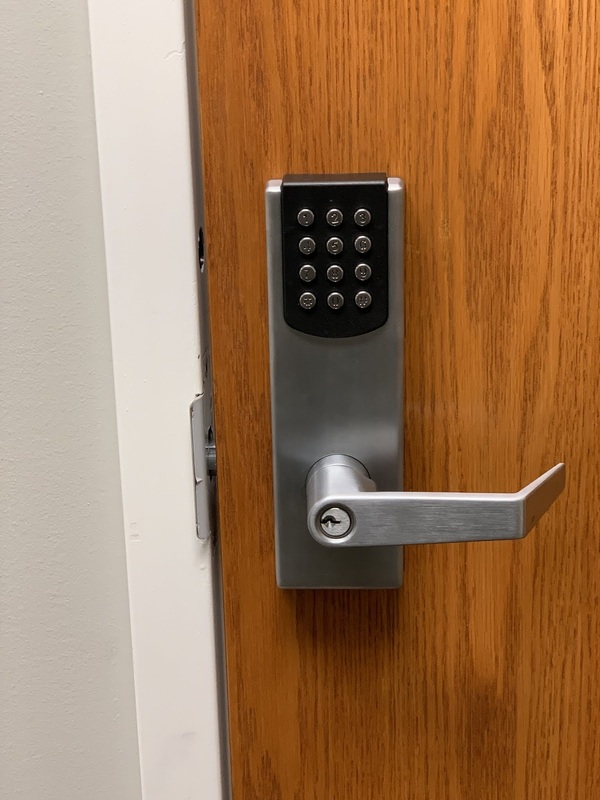 We also master keyed the mechanical key cylinder in the lever to allow for the building manager to enjoy unfettered access without having to have multiple differing keys for all doors in the building. Learn more about Tellcard Systems by clicking on the link the source below. 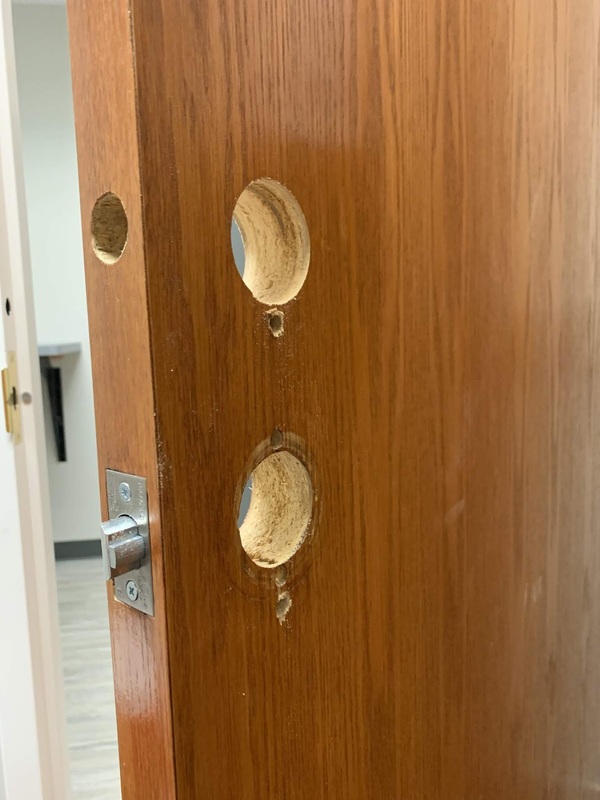 The Society Of Professional Locksmiths continues to grow in stature and offers unique training and fraternity for aspiring locksmiths, click the link above to learn more.